I really hope someone does a full-size scooter in all of these Rococo flourishes. This really is a neat toy. 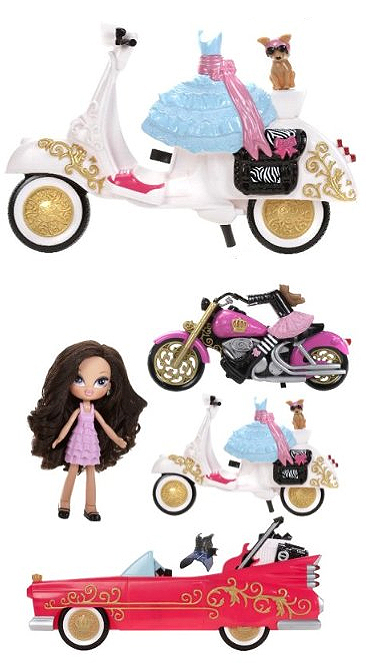 You just snap the vehicles and outfits onto the Bratz dolls â€”Â all in one fell swoop. Available at Target and other retailers. Thanks to both our own Timmy T. and longtime Swagster Aleks H. for this find. This entry was posted in Miscellaneous, Models, Figurines, Toys and tagged Bratz, dolls, scooter, vespa by Tracy. Bookmark the permalink.